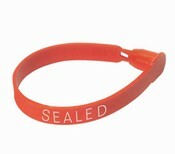 High Security Seals are the strongest type of seal. High Security seals provide the most protection for shipments and serves the purpose of delaying or discouraging intruders. These seals typically meet ISO 17712 standards and are designed to keep people out or make it extremely difficult for them to gain access to your high-risk and high-value shipments. High Security Seals require heavy-duty bolt or cable cutters for removal, they cannot be removed by hand. 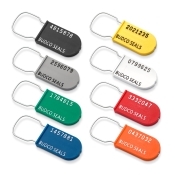 BudcoSecuritySeals.com stocks several styles of Bolt Security Seals to meet the application requirements for high security standards. The SnapTracker Bolt Security Seals are a barrier class security seal, designed for securing high value cargo. A solid steel bolt provides strength while a molded plastic coating provides tamper-evidence. **THESE HIGH SECURITY BOLT SEALS MEET WITH THE ISO 17712:2010 STANDARD. Plastic Padlock Security Seals have a wire hasp with plastic body security seal that can be used in a variety of applications. It can also be barcoded. Plastic Trailer Truck Security Seals are used heavily within the Freight & Cargo, Retail, Cash & Transit and Airline Industries. Due to its patented design, the Plastic Truck Security Seals are the easiest to use and the strongest plastic trailer truck seals available. Ships Next Business Day!